Sitting in the same site as the drug store was Edmund and Martha Andrew’s house. The Andrew family came to Brooklyn in the fall of 1866. Purchasing property from George Capwell, this building was built in the middle 1860’s. The neighboring property sites were being sold to beginning merchants. Moving away from Merchant Street (now called Commercial Street), a bigger house was built nearby, destined to be known as the Andrew House. Later in 1900, Albert Ellis bought this Andrew House too. Living in the Rutland area, Albert Ellis, a young pharmacist, purchased the first Andrew residence in 1879 on Merchant Street. Brooklyn had a drug store. Ellis refitted the downstairs and stocked shelves with jewelry, fancy China-ware, paints and oils for drawings with his small pharmacy and medical aids. The ‘over the counter wonder drugs’ declaring miraculous potions of relieving pain and irregularity were advertised in ‘The Brooklyn News.’ Some of the ‘cure-all’ medicines were Electric Bitters, Dr. King’s New Life Pills and Little Early Risers Pills. The Ellis Drug Store survived three fires. In 1882, the store was a total loss. With the help of the village people, the building was restored within a week. Business was restored. Eleven years later, 1893, fire consumed the building. Due to the falling of the insurance company, only a small portion of insurance was given to Ellis. More determined than ever, Ellis rebuilt. Again in 1905, fire destroyed his business. And, again, Ellis rebuilt and remained in business until 1918. In the local newspaper of October 1917, it stated ‘The Ellis property is for sale, inquire of W.E. Guynop.’ The following year, John Collins from Blue River bought Ellis’ stock and the building from Guynop. John and his wife, Ida lived above the drug store. Both Ellis and Collins were part of the village board, taking a concern in the village’s growth. Ellis was the vice-president of the Capital Chair Company in 1901. Collins stayed until 1926. Then, Jesse Dietz brought his pharmacist expertise from the Soquet Drug Store in Green Bay. He bought the stock from Collins and the property from Guynop. Like the Collins, Jesse and his wife, Mayme lived upstairs until they purchased the house on Hotel Street. During his ownership, Dietz bought the former Millspaugh Harness & Furniture Store, north of the drug store. Dietz retired in 1949. A new owner was seen at the drug store; Ellis Fink. Originally from Pawnee, Nebraska, the Fink family became acquainted with Wisconsin on a vacation. They decided to move to Milwaukee and raise their daughters there. 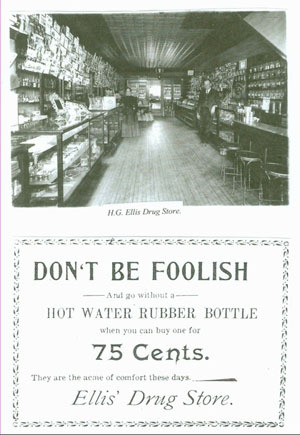 Having pharmacy training at a Rennebohm Store, Fink made the decision to move to Brooklyn to purchase the drug store. When the drug store changed hands in 1972; Casey Neath and Louie Fahey operated the merchandise for sales. The drug store supplied medical needs for the local people. After school and after supper, the drug store was a great hang-out for the younger crowds. The owners were always very supportive of the church and school programs, selling tickets and supplying school needs. 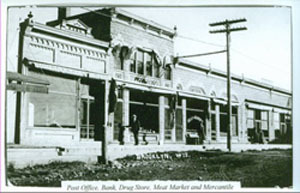 The Brooklyn Bank was located two store fronts west of the drug store. They were in the process of expanding. Both stores were torn down, including the drug store in 1975. The drug store was known as the tallest building. Ellis and his wife with early advertising.